A guide friend and colleague of mine has been putting out some pretty awesome flies lately. By awesome I mean big, multiple articulated, often flashy streamers using a special “material” (more on that in a bit). Now this is not the kind of fly tying that I normally do. I’m a practical, often simple, pragmatic fly tyer. The simpler the better is what I normally strive for. Much of this has to do with is the fact that I use many of the flies I tie for my guided fishing trips. This is not to say that he doesn’t use his flies for guiding as well. I would venture a guess he uses as many or more of his own ties than me or anyone else. Many of the great anglers and guides out there tie their own flies. What tying for guided trips has taught me is that I need flies that work, are easy to tie quickly, are relatively inexpensive to tie, and are durable. Because of this I have often avoided, if not down right ignored the type of fly tying that he and some others are doing. I will tie a bigger streamer occasionally, but often it still conforms to my parameters stated above. That was until the other day. 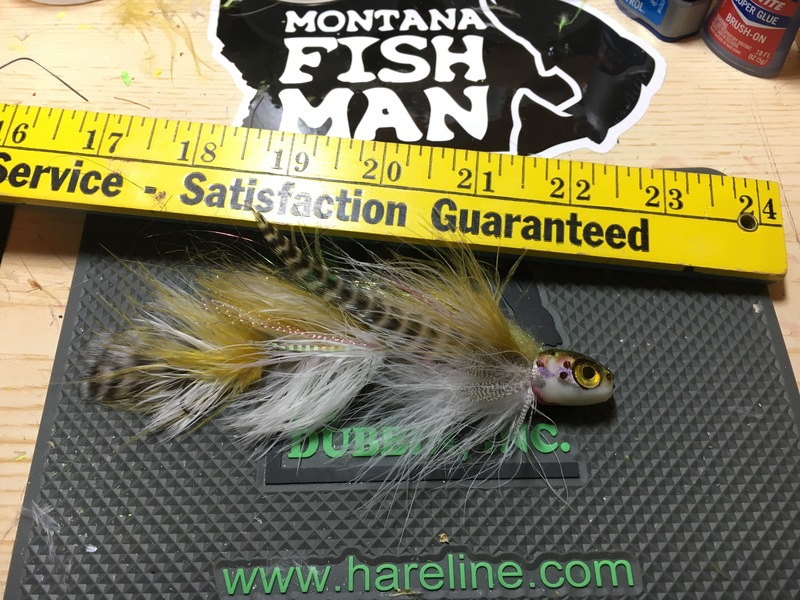 He has been posting some great looking big (5-8 inch) streamers lately and one of the features was just way to cool and unique to ignore. 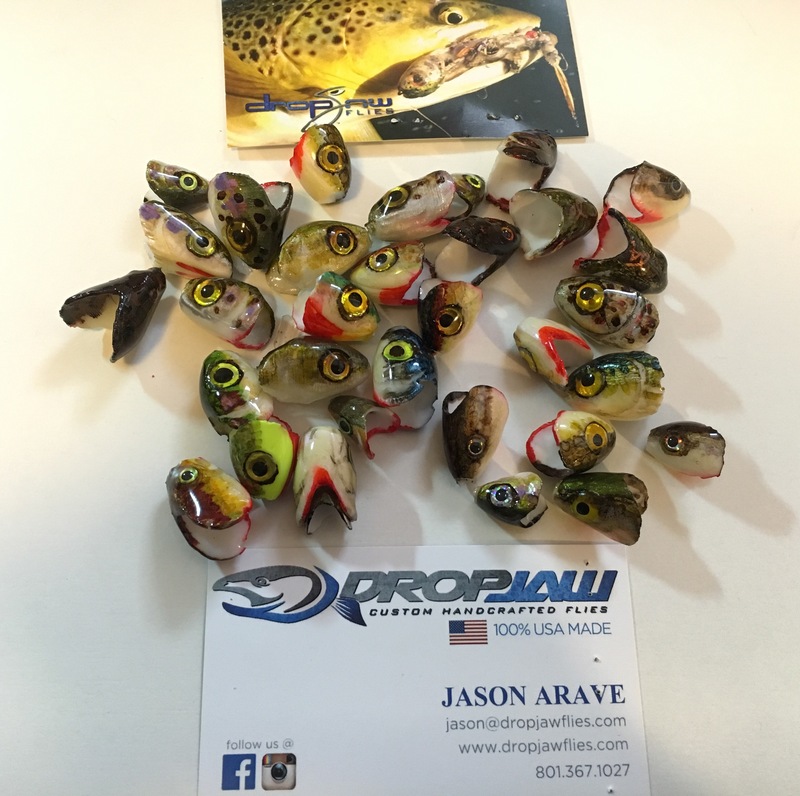 The heads of these streamers are made with a product by Drop Jaw Flies. These heads look very much like real fish heads and so bring a realism to the fly that we don’t see often and or we don’t see done successfully. Some ultra realistic flies look great but lack the movement needed to entice a bite. Not the case here. These fish heads can be paired with materials that bring the entire fly to life. I just had to try these out. Of course that means I quickly placed an order and waited with the anticipation of a child on Christmas. Just because I don’t normally tie like this doesn’t mean that I don’t like too. It just means I don’t. I received my fish head goodies in the mail today and after being responsible and working on fly orders I couldn’t wait to try. Fish heads, fish heads, rollie pollie fish heads. This is the sample pack. There are many styles and sizes to choose from and something for everyone. These are all hand painted and everyone is little different than the next. No two seem to be exactly the same. I sat down and did something I rarely do and that was spend almost and hour tying one fly. Now some of that was spent on proportion, color, how will it fit together and so on. But that’s still 45 minutes longer than I might normally spend doing that for a single fly. After all that I have to admit that it was fun. I’m reasonably happy with the outcome and I plan on making more of these. Even if it takes me an hour each time. I hope you enjoy and if you feel the need to tie something big, nasty, and cool looking check these guys out. I know I’ll keep them around. Until the next time, Keep your tip up.